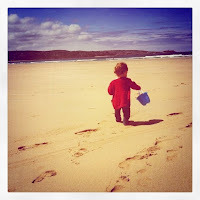 At the beginning of June we headed out for our much anticipated holiday in Cornwall with my family. Unfortunately, Cornwall is in England, and so we were greeted with traditional English weather for most of the week we were there. I wasn't looking forward to the flight over to Bristol (see the article Travelling with Babies for my reasons why). I fully expected Lydia to be fidgety and restless, generally screaming us into insanity. To my surprise and delight, she was (almost) as good as gold. Apart from a mini-whinge, she slept on Chris, and so our flight passed without too much drama. We landed in Bristol on time, then picked up our rental car and started the 3 hour drive down to St. Ives in Cornwall. Well, normally it would have been a 3 hour drive, if it wasn't for ridiculous amounts of traffic on the M5. We were crawling along bumper to bumper in 3 lanes of queuing traffic for what seemed like forever - after about an hour of driving we had managed to move approximately 20 miles away from the airport. With Lydia showing clear signs of boredom, we pulled off at the service station and had a coffee, giving Lydia her evening bottle of milk. Having rested for around half an hour, we plucked up the courage to head back to the car. Fortunately, whatever was causing the traffic jam on the motorway seemed to have cleared, and we set off at normal speeds to finally kick-start the journey to Cornwall. We made it to the holiday camp in Hayle at around 10pm, so naturally little Lydia was a bit grumpy. She had slept for most of the journey from the service station down to Cornwall, but woke up about 45 minutes from the end in a bad mood. To her credit, she managed to give my waiting family a few smiles before we put her to bed. We sat up chatting to my folks for a while before turning in for the night. I was desperate for Lydia to show off her new found walking skills (as mentioned in Now There's No Stopping Her! ), but that would have to wait until the morning. The next day we woke up to somewhat grey skies. Light rain was forecast for later in the day, but that didn't matter too much as the day would just be spent catching up with my family, and most importantly for them to get some quality time in with Lydia. As I had hoped, Lydia was strutting around like she owned the holiday chalet, playing gleefully with my dad and my brother James. Later in the morning I played a game of tennis with my parents and James, while Chris and James' wife Kelly babysat a napping Lydia. The tennis match ended as a draw (1 set all) as our time on the court ran out before we could finish properly. Yum, yum - fish & chips! ﻿For lunch we went to have a look at the beach, giving us our first glimpse of the sea since arriving in Cornwall. It was windy and not particularly pleasant weather, so we headed quickly inside a small café next to a surf shack for lunch. 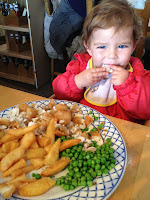 Here Lydia tried English fish and chips for the first time - she managed to eat most of it, so I guess her English side is starting to shine through! In the afternoon we went back to the camp and sat in the café next to the swimming pool to enjoy a nice drink. Lydia delighted in walking around the café's spacious seating area, occasionally walking up to other holidaying families and acting as though she had the right to go wherever she wanted. The extra freedom she's gained since learning to walk seemed to have given her confidence a massive boost. Later that day we picked up a takeaway from the café and ate dinner in the chalet, with Lydia sleeping peacefully. I was impressed with how easily Lydia was sleeping in a strange environment. 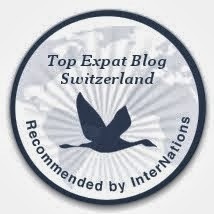 In our previous holiday in Nax this year (see A Week In Nax) Lydia had terrible trouble getting to sleep. As soon as we put her in the travel bed she would stand up and scream, often crying for up to 30 minutes before finally falling asleep. This applied to naps as well as night time, and was a cause of much stress during our Nax holiday. Thankfully, she slept much better in Cornwall. When we woke up on Monday morning we were greeted with blue skies and a sunny forecast. That meant only one thing - today would be a beach day. We packed up towels and beach toys, as well as balls and a kite, and made our way to Hayle's sandy shores. The beach at the holiday camp was huge, the sand stretching off into the distance to the left and the right. We picked a spot and laid down the towels, then it was time to see how Lydia would react the sand and the chilly sea. She wasn't a big fan of the sand. Lydia doesn't like having things stuck to her hand, and I think getting sand stuck between her fingers annoyed her. With a bit of gentle coaxing, she did manage to play with the bucket and spade. My mum and Chris then took her down to the sea to see how she would react to paddling in the cool waters of the Atlantic Ocean. She was a bit surprised at first at the feel of the cold water but then decided it wasn't too bad, and enjoyed walking across the beach with her little bucket to get some water! She also enjoyed licking the salty water off her hand afterwards... nice! So, Lydia's first day out at a real beach was pretty successful. She did - eventually - play with the sand, and had fun walking to the sea and tasting seawater, so all in all a good day out. One of the main reasons why I wanted to go to Cornwall for our holiday (aside from spending time with my family, of course) was to see how Lydia would react to being on a beach. When I was young, we went to the beach in England every year for our summer holiday, and would spend hours playing in the sand, digging holes, paddling in the sea, building sand castles, jumping off dunes and looking in rock pools for crabs. I would love to see Lydia growing up enjoying these activities as well, so I was really pleased that she didn't object to a day out at the beach. Hopefully next year's holiday will see her enjoy it even more! The next day was also fairly sunny, although the sun came in sometimes quite brief spells, and the wind had picked up a bit. We went to the beach for a little while in St. Ives, also strolling around the nice harbour, having lunch in a good restaurant (where Lydia tried - and enjoyed - mussles in garlic sauce) and enjoying an ice cream by the sea. 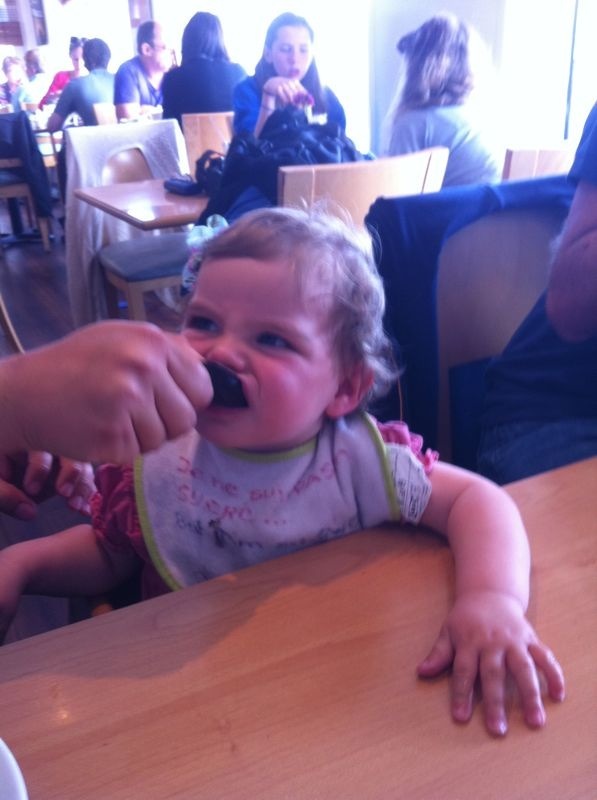 Lydia was well behaved for the majority of the day too, so that only added to our enjoyment. This was the day of the Royal Wedding, with Prince William marrying Katherine Middleton (congratulations to them). As in most towns in Britain, St. Ives had street parties to celebrate the joyous occasion. Sadly the afternoon brought a fair helping of rain which dampened the party atmosphere a bit, but the people of St. Ives still shared a nice afternoon together with cakes and other assorted goods. So, that was pretty much the last of the sun for the rest of the week, aside from a couple of hours of blue sky on the Friday. We were instead treated to clouds, occasional (and sometimes torrential) rain, and near-gale force winds. That meant we were stuck being cooped up inside for a lot of the time, which is not ideal when you have a small child, as they really need to get out every day. We went on a trip to Newquay where we had planned to check out the aquarium, but were put off by the size of the queue. We also went to a local animal sanctuary to see if Lydia would enjoy seeing the animals. She didn't. We took her to an indoor play centre that had a designated area for babies and young toddlers, which she seemed to enjoy, and where we were treated to a hilarious scene involving a plastic playhouse: two older girls (maybe aged 4-5) were sitting in said playhouse when Lydia walked up, open the door and went inside. What happened next could only be described as a stand off - the two girls glared at the unwelcome intruder, while Lydia couldn't understand their angry looks as she only wanted to play. Several tense seconds passed before Lydia opted (possibly quite wisely) to leave the house and play elsewhere, much to the relief of the other girls. In the evenings the holiday camp had entertainment shows for kids and adults, and one evening we took Lydia to the kids show, where the entertainers were getting children to do somersaults onto a crash mat (I think it was circus evening, or something like that). At one point they asked the kids to put their hands in the air if they wanted to do a somersault - Lydia promptly put her hands up as well, bless her! She also joined the queue with the other kids (who were all over the age of 5), and got a bit annoyed when we pulled her away. We also took Lydia to the swimming pool in the holiday camp, getting her dressed up in a little bathing costume and buying an inflatable baby ring. She loved being pulled around the water in the ring, with me splashing around next to her, but as with most things Lydia only lasted a few minutes before getting a bit bored. We went back to the pool one other time and it was pretty much the same thing. Generally speaking though, she did seem to enjoy the experience, so it was worth taking her swimming. As our holiday came to an end, it was time for us to head back to the airport, and make our way home. We left the holiday camp nice and early in the anticipation of another traffic jam on the M5. Instead, we hit traffic on the A road that takes us from Cornwall to the M5. Crawling along ridiculously slowly once again, Chris began to panic about potentially missing our flight. Apparently that day was also the start (or possibly the end) of the Royal Cornwall Show, which would explain the traffic. We had a break from the traffic when we stopped for a burger and chips at a little roadside cafe, and then hit the road again. Once we got onto the M5 the traffic was much better, and in the end we made it to the airport roughly 3 hours before our flight was due to leave. Oh well, at least it was better than being late. Once again, Lydia gave us the pleasant surprise of sleeping on the plane, so we were able to let the stress of driving in traffic fully disappear. We left England behind us with plenty of memories of Lydia's first beach adventure. It had been a week of several firsts for her, including paddling in the sea, tasting sand and seawater, and eating a Cornish pasty and mussels (separately, mind you). I think we will head back to Cornwall with Lydia again in the future, but next time we'll hopefully have better weather!